Port Aransas and Mustang Island are the perfect places to enjoy boating of every kind during your beach resort vacation. Powerboats and sailboats of every description are available for charter for exploring Corpus Christi Bay or adventures out into the Gulf of Mexico. Also is the unusual opportunity to have the entire family explore Mustang Island State Park which offers kayaking in the shallow waters of Corpus Christi Bay. Kayak rentals and shuttles are available locally and lessons for all levels of experience. 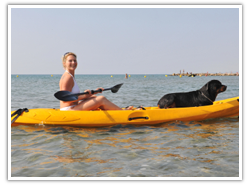 Mustang Island is an ideal place to kayak in the shallow waters of Corpus Christi Bay. The Mustang Island State Park paddling trails consist of three different trails totaling over 20 miles. The trails go through some of the best shallow-water fishing areas and bird watching sites. More information about these trails, maps and a list of vendors providing kayaks and shuttle services can be found on the State Park’s website. The protected waters of Corpus Christi Bay provide a great place to enjoy cruising. The Bay is very popular for fishing and observing wildlife wetlands. The Gulf of Mexico provides the experience of ocean cruising. Island Queen, Inc 136 W. Cotter, Port Aransas, (361) 749-6969. Bay fishing & dolphin watch nature tours. Reservations Required. Island Queen is a Sandpiper Co-Branding Partner and will offer Sandpiper guests a discount upon presentation of the W.A.Y card available at the Sandpiper front desk. Bay fishing & dolphin watch nature tours. Reservations Required. Island Queen is a Sandpiper Co-Branding Partner and will offer Sandpiper guests a discount upon presentation of the W.A.Y card available at the Sandpiper front desk.